Form fitting neoprene material stretches to accommodate most laptops with a 13.3" display. 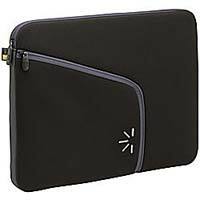 Sueded internal lining and durable neoprene cushion and protect your computer. Slimline design protects laptop on its own or in your favorite bag. Asymmetrical zipper provides easy access to your laptop. 12.5" x 9.4" x 1.5"
13.5" x 10.3" x 1.8"